7 more new Trek ship additions. This will be the last Star Trek-related update for a while as I start moving into the new Yamato 2199/2202 ships, and there are quite a few of them. Should have something new in the next month or two. 21 more new Trek ship additions. Several new updates to the Trek Chronology. Happy New Year and welcome back! I know it's been a very long time since the last update (2 years and 2 months), and I unfortunately missed doing anything for the 20th anniversary of the site. I'm somewhat in awe that this site has been around so long. Several major things got in the way of this, including two rather large moves (one cross-country), but things are beginning to settle now and I'm starting to get around to addressing my backlog. So! There have been a lot of exciting things going on in certain areas of science fiction these past couple of years. First off, we've had another Star Trek movie, "Beyond", as well as the beginning of the first new Trek series since Enterprise went off the air more than a decade ago, in the form of "Discovery". Additionally, the world of Space Battleship Yamato got a full reboot with "Star Blazers/Yamato 2199" and "2202", retelling the Iscandar and White Comet stories, with beautiful re-imaginings of all the existing vessels we've come to know. If you Hollywood folks are reading this - SB2199 and 2202 are how a reboot should be made! 'Nuff said on that one. I'm going after the Trek designs first, but I will be attacking the Yamato designs in the coming months as well in an attempt to get fully caught up with everything. Thanks to the Eaglemoss Official Starships collection, I'm close to getting the backlog of official ships up-to-date, along with some new and updated fan-made designs. The Trek Chronology section has a link to the new additions to the database. Added a new set of updates in the Star Trek section. Unfortunately, this is not a schematics update. Apologies for taking so long; I know it's been almost a year since my last update, but I just finished a cross-country move to a new location and things have been kind of crazy. However, I did want to take the time to reflect and honor a major contributor to this site who recently passed. "It's with a very heavy heart that I must announce that my brother in law, Neale Davidson, passed away around 3:30am (Colorado time) at the age of 44 from a massive stroke. He was surrounded by family and went peacefully. Pictured is he and my sister on their wedding day a little over 25 yrs ago where their journey began....." - with Neale Davidson. Neale was a contributor of no less than 611 individual designs to the SSDB over the years - probably one of my most prolific supporters. Many of his illustrations showed a unique interest and tralent in starship design. He dug up old little-known and esotreric ships and made them new again, and he made new creations that transcended more than just moving around a nacelle or surface feature of someone else's work and call it his own. It is a sad loss to the starship technology community, and my thoughts and prayers go with him and his family, whom he leaves behind. Rest in peace, Neale, you will be missed! Added a large new set of updates in the Star Trek section. Added a small but significant functional change in the Star Trek section. Happy New Year everyone! Made some small fixes and added a handful of updates in the Star Trek section. 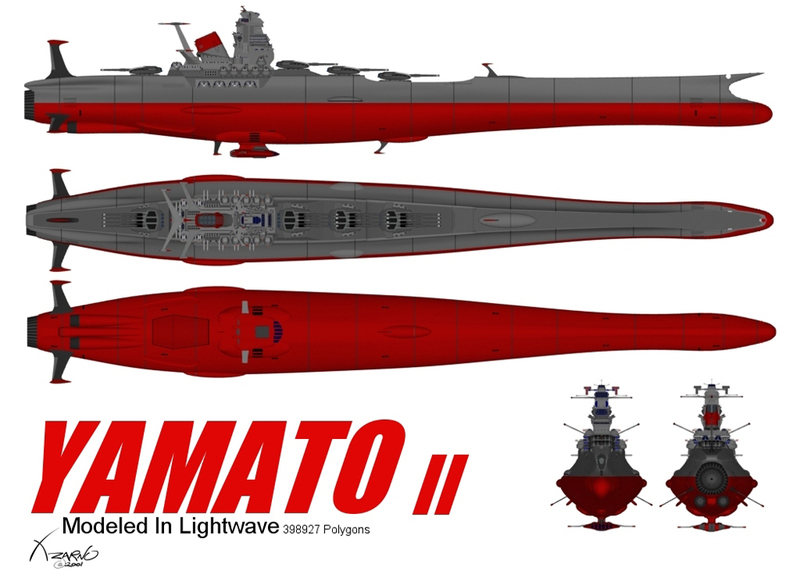 A couple of small updates in the Space Battleship Yamato section have been uploaded. A few additions to the Battlestar Galactica section as well. More updates, clearing up the enormous backlog of designs in the Star Trek section. Continuing with this massive batch of updates, a new set of Battlestar Galactica ships are now available. As promised (after several years), a major Yamato Update! New Federation and Klingon ships in the Star Trek Section. New Colonial and Cylon ships in the Battlestar Galactica Section. 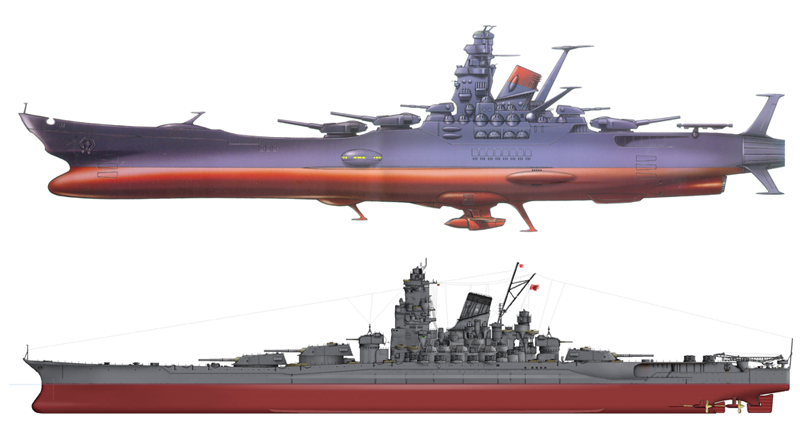 Next update will be pure Yamato, including the new vessels from Space Battleship Yamato: Resurrection! Many new Non-Federation ships in the Star Trek Section. 108 new Federation ships in the Star Trek Section. Large batch of starship updates in the Star Trek Section. Some new Battlestar stuff coming soon! Small coding change mentioned in the Star Trek Section. NEW TOS Shuttle (Mk I) now complete in the Battlestar Galactica Section. 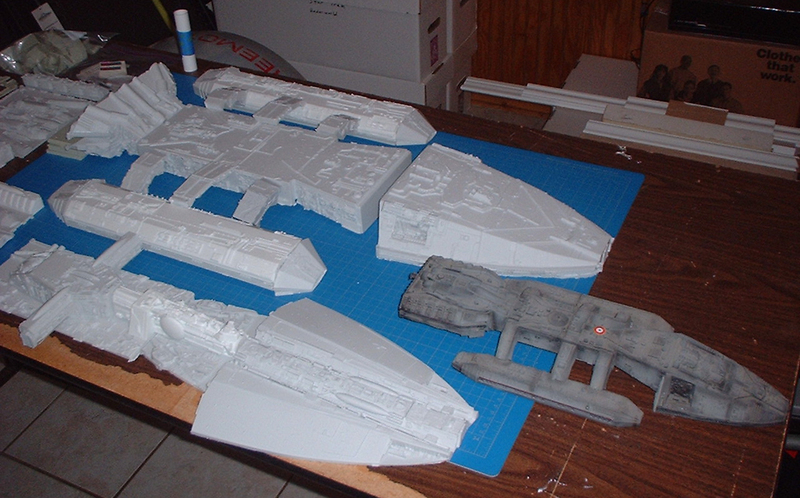 Update for Galactica:1980 Cylon A/B Fighter now complete in the Battlestar Galactica Section. NEW TOS BSG Eastern Alliance Destroyer now complete in the Battlestar Galactica Section. TOS BSG 6th Millennium Fighter update now complete in the Battlestar Galactica Section. Updated 5 Colonial vessels, added 18 new Colonial vessels and 3 Cylon ships in the Battlestar Galactica Section. Added 45 new ships in the Star Trek Section. Federation Abramsverse starship additions in the Star Trek Section. Klingons, Romulans, Vulcans, etc. updates in the Star Trek Section. BIG - and I mean BIG update in the Star Trek section. Once I get the rest of the non-Federation designs and the Nu-J.J.-Trek ships online, I will be going back to Battlestar Galactica, as many models have been revealed in recent years now that the show has run to its completion. In addition to NuBSG ships, I will be rebuilding the Galactica: 1980 Cylon A/B Fighter, and creating new schematics for the TOS Colonial Shuttle and Eastern Alliance Destroyer. Keep watching for updates on this! Happy New Year all! I'm starting to ramp up some updates, but it seems I have a few left-overs in my queue from way back. Some are updates, others are semi-new. See them here in the Star Trek section. WELL! It's been 3 years and I'm finally starting to come back into schematics-land. It's been quite a wild few years for me - don't need to get into all the details - suffice it to say I'm back and I have a HUGE backlog of ships that need to start going out soon. In preparation for the next series of releases, I started looking at the old girl and, I must say, she was starting to show her age - very 90's. The first thing you might notice is a change in the front page. I've been looking through various open source jQuery toolkits on AjaxRain.com and I found a REALLY neat little Hover Effect Tool that I just had to integrate into the front page. Unfortunately, the transparent .png shadow files are misbehaving in Internet Explorer 7 and below (haven't tested it with IE8 yet). Sorry Microsoft Users. Hate to say it, but Firefox is the tao of the web now, my friends. So, long story short, the front page has been Web 2.0-ized for the 21st century. In addition to the facelift, I've done some other housecleaning, including making the data tables easier to read with alternating color rows, and I have completely rebuilt the entire site in PHP. Perl 5 was also starting to show its age and I managed to do some serious streamlining with the PHP upgrade. The port was, thankfully, much smoother than I thought it would be. You might also notice a little icon at the bottom of each page: It is a small banner that I put up after having made the entire site HTML 4.01 W3C compliant. I tried using the "strict" guidelines for the compliancy, but they were way too...well...strict. I wound up using the "loose" guidelines, and everything seems to look pretty good. In other news, the SSDB was asked to provide some Battlestar Galactica schematics to Coilhouse Magazine for background illustrations in an interview with Ron Moore from the new show. You can see the cover art of the magainze in the References, Reviews and Awards section. I admittedly used TOS schematics, but technically, all the old stuff was hidden away in the new series as well, so it wasn't that much of a big deal. 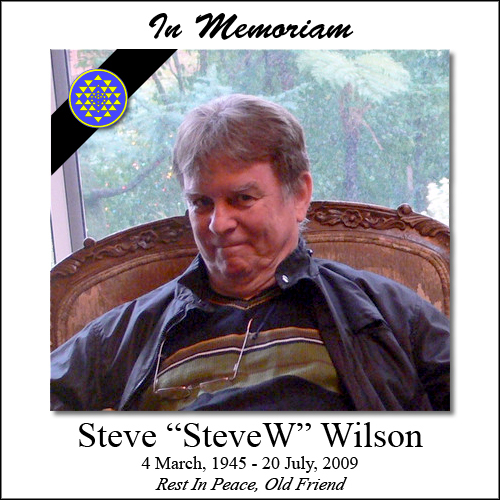 Finally, it is my sad duty to report the passing of Steve "SteveW" Wilson. He was a major contributor to my Ship Schematics Database many years ago in the Battlestar section - an extremely kind and talented individual - a pioneer in CG design back in the mid-90's, before many people jumped into it with the fervency that we see today. 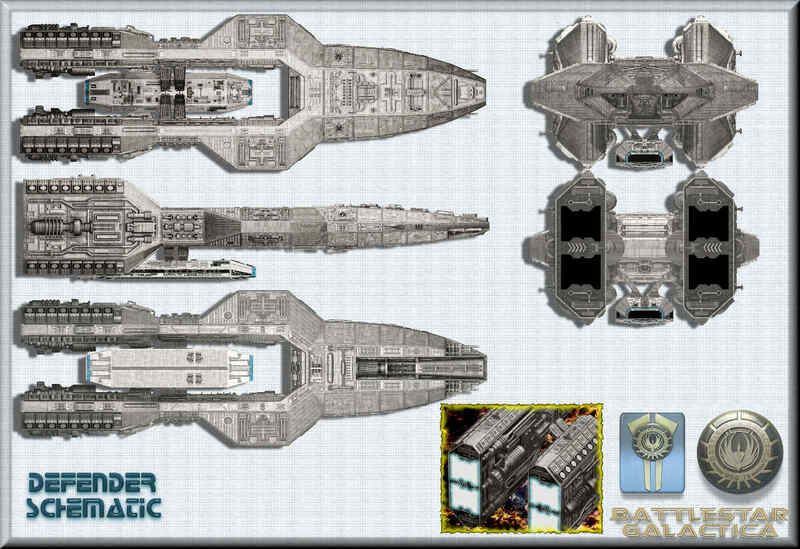 His original design, the Colonial Defender even made its way into the Rag Tag Fleet of the new show to make it an "official" piece of Battlestar Lore. Take a trip to the Colonial Capital Ships section to see his creations. I have taken the liberty of putting together a memorial pic of Steve, with help from the good folks at the Colonial Fleets Forums. A thread dedicated to his memory is located here. Well, that's about it for now. I will be coming back to put in some new additions to the database in the near future. I'm in the process of securing permissions for a large number of backlogged files. In the meantime, stay tuned! 1 New Federation ship in the Star Trek section. 42 New Federation ships, 3 Federation updates and 1 new non-affiliated ship in the Star Trek section. 1 Colonial update in the Battlestar Galactica section. New ships from Masao Okazaki & The Starfleet Museum in the Star Trek section. New ships and a few updates in the Babylon 5 section. This completes my current backlog of B5-related ships. This will likely be the last major release for quite a while. New ships and a few updates in the Space Battleship Yamato section. This completes my current backlog of Yamato-related ships. This will likely be the last major release for quite a while until something new comes out of Japan. New ships and a few updates in the Battlestar Galactica section, including the first set of ships from the new series. This completes my current backlog of BSG-related ships. I hope to have more as the new series progresses. I suspect this will be the only "semi-active" section of the entire SSDB from now on. I've discovered a special treat for fans of the 2006 Ships of the Line calendar in the Star Trek section. Enjoy! Made some small updates and added two new designs in the Sean Tourangeau series in the Star Trek section. Well, it's been a weird week. My apologies to all for the downtime of the server and the general confusion, mayhem and havoc that was caused. I honestly thought this was the proverbial "it". I communicated my desire to shut down the site and explained my situation. I have now struck up a new deal with my ISP, IsoMedia, to provide greater bandwidth and continued service for less $$$$. The one catch is, I now have a banner showing up at the bottom of the page. I had always prided myself of not having such things, but in this instance, I suspect it is either this or indefinite closure. I picked the former and I hope the banners aren't too much of an irritant. In any case, yes, I am back again! I guess the previous "I'm dead in the water" message I put out on April 1 wound up being an April Fool's Joke after all. Finally, I want to convey my greatest thanks to the kind words and condolences I received in the short time the site was down. It's gratifying to know there are still good souls out there in the world ready to lend a helping hand to their fellow man. This goes especially for Jason Martin, John Patuto, Matt Wheeler, "TheCrmsnPyrut" and Will. Thanks again to you guys! Now get back to downloading, dammit! For the final day of February, the FINAL mass Star Trek update. As a reminder, I will not be accepting any new designs in the database. From this point forward, I will restrict updates to the occasional official schematic I may come across, or some fan-made thing that is simply too cool to overlook - at my discretion. Second batch of Trek updates online - Federation only. Hello again! As promised, I have begun the final sets of updates. The first set is a large update containing all remaining "official" canonical designs that I have found on all Trek series. There are still a few out there from Star Trek: Enterprise that I'm looking for and will continue to put out there after my final submissions are complete, bit by bit, as I get them. Greetings users of the SSDB and Happy New Year in advance. I have finally commenced major efforts to push out the final, yes FINAL update to the SSDB. It will include as many official designs from Enterprise that I could find, the absurdly overabundant "ships/aliens of the week" from Voyager, some official Babylon 5 designs and many schematics from the new Battlestar Galactica series (some of which are actually TOS designs rebuilt as CG models). There will also be the deployment of the vast backlog of user-submitted designs that I currently have in my archives. The good news is, almost all the official Trek ships are done and will be deployed soon. The bad news is, that's only a small fraction of what needs to get done. From this time forward, I will not be accepting any new fan-submitted designs. It has been a long haul, and there are too many other things that have occupied my life in recent years for me to effectively maintain this site. Not the least of which the fact that three of the four genres I support on this site are now effectively dead. Only Battlestar Galactica and her ragtag fleet survives in her new incarnation. I may add a few official Battlestar-related designs down the road, but I must soon move on. Of course, the site will remain alive as long as I can afford it, but that shall be the extent of my involvement for a VERY long time to come. I appreciate all the support and efforts given to me by the users of the SSDB. Keep your eyes open for new updates in the coming weeks/months. This time it's happening! Thanks very much and take care! Hello again. As before, this is not the usual schematic update. You may have noticed some problems with the database in recent days. My ISP changed my PERL interpreter path without notifying me. It was an inconvenience, but not a big deal which was easily fixed. My apologies for issues that may have caused people. On to different news. I will be setting out soon to liquidate my backlog of official and fan-made designs for the final time. The database has been a wonderful experience for me, but other life-related priorities have taken me in different directions. Maybe one day I will return to the SSDB and pick up where I left off, but I think this will be the proverbial "it". I still have a ton of official designs I need to scan from the now-ended Official Fact Files and Official Magazine and an equally daunting pile of fan-made designs that I have collected over the years since the last real update. I plan on fleshing out not only the Star Trek section (including the scant-few official "Enterprise" series designs available), but also Battlestar Galactica (to support designs from the new show), Space Battleship Yamato and Babylon Five. Once this final update will be made, my involvement with the site will be one of administration only to fix the problems the likes of which we've recently seen at the server and code level. No more designs will be accepted or included in the database and, no, I don't want to hand the site over to someone else to maintain. This has been my baby and, selfishness not withstanding, there is a certain pride-of-ownership attitude that I have here. So, please don't email me about these things. It's been a good run for over the past seven years that the SSDB has been operational and 400,000+ user hits, but I think it's time to move on to other things. I hope to have these changes done within the next couple of months, provided my old scanner can keep running. You all have my word that I will keep the site running for as long as I can at my own expense until I either A) run out of money, or B) my ISP shuts me down for hogging their bandwidth (neither of which has happened yet, thankfully). Thanks again, and I'll see you all in a few! Greetings, all. This is not the usual schematic update, so apologies for that. It is my sad duty to inform the Trek Tech and Schematics Community of the loss of one of our designers due to heart failure as a final resault of his Muscular Dystrophy. 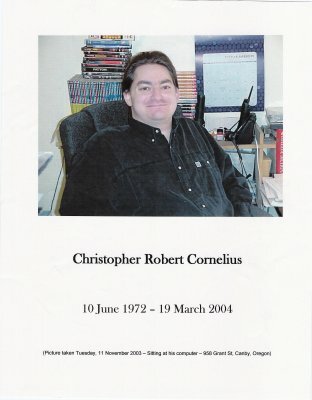 His name was Christopher Robert Cornelius and was a contributor of some good designs back in 2002. His work can be found in the Star Trek section under the February 22, 2002 Update. I was given this memoriam image for inclusion in the database. 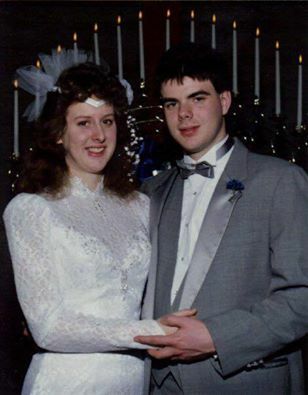 The thing that I guess gets me the most is that Chris was two years younger than me and almost the same age as my wife. Always strange to see one so young have his life end before his time. Farewell, Chris. You will be missed. Many thanks to Paul Hassett for providing me with the image and information. Had a little hickup over the weekend with the cgi scripts, but the site seems to be back up and running fully now. The hit counter is still a little FUBAR, but I'm working on it. I am still alive, and I do plan on getting back to the site early next year. I just ask for patience. Thanks again! This small update is currently located in the Yamato section, particularly regarding Leiji Matsumoto's new "Great Yamato"/"Great Galaxy" project and my take on the whole "universe change", etc. As for future updates to the site, I'll be looking at gearing back up towards the end of the year, when many of my current responsibilities with work and Lodge tone down a bit. Until then, all I ask is patience. Well, we had a minor glitch, but I think everything's worked out now. It seems that there was a recent hack attack on the servers that this site happens to be co-located at. Long story short, they ran a bunch of security updates and patches, resulting in a fundamental change in many of my custom configurations. So, I had to move my CGI's into a new directory and re-code ALL the pages to reflect this change. I think I got them all, but I'm not 100% positive. I've had a lot of requests to update the site. Usually I ignore these, as they come in almost every day. However, in fairness, I should note that my time, as of late, has been EXTREMELY limited. This is due largely to the purchase of my first house last year with my wife of eight years, and some new commitments I have recently found myself in with regards to Freemasonry. For those of you who don't know, Freemasonry is a fraternity dating back to 1717 in England and some trace our roots as far back as the Knights Templar and some even farther back to the Ancient Egyptian Mystery Schools (although I haven't seen much in the way of evidence to corroborate that). If all goes as planned, I will be Master of my Lodge next year and will have quite a full plate until the end of 2003. I feel I have done enough preparation to have a somewhat smooth year next year, but there's no telling until I'm actually there in the Big Chair. I've also had to cut back on other commitments, such as historical re-enacting, model building and vehicle restoration. These are all things I really enjoy doing. The Ship Schematics site is up there, a labor of love that I've fostered for the past 5+ years. It's not going away, but the updates will likely be on hold until later on next year when things loosen up enough for me to fire up the old scanner and start getting some new ships out there. Many apologies to those who have awaited NX schematics with baited breath. I might find time to do some special (and small) things like that, but I give no promises and make no guarantees. Special thanks goes out to Ed Hawkins of SpaceCruiserYamato.com for hooking me up with IsoMedia out in Washington State. They were extremely helpful and instrumental in getting the SSDB back up and running, going so far as helping out with special CGI customization that the site required. Thanks again for all your words of support, comments, questions and corrections to make SSDB one of the largest, most accurate and comprehensive Trek-related site on the 'Net. I couldn't have done it without you. Just cleared out the queue of pending Star Trek ships, Battlestar Galactica ships and Space Battleship Yamato ships. I will be working on scanning in official designs from the Fact Files and fleshing out the B5 section soon. SSDB goes back online after an eight-month downtime, with the addition of the new Babylon Five section. Added a new fan-made design to the Yamato section, Don Gaiser's Yamato II design and Brian Rivers' Lazerous design. Hello folks and Happy New Year (almost 4 months late, but what the heck). 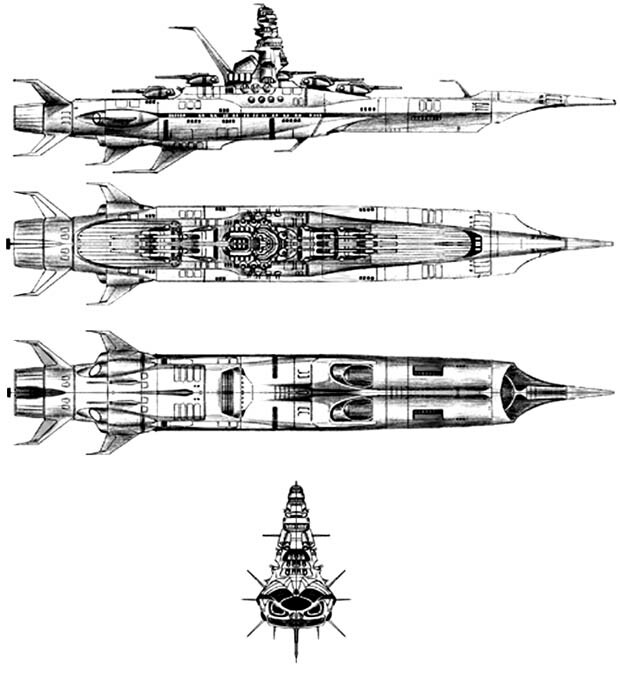 Anyway, to start off the new millennium for the Starship Schematics Database, I have added the next installment, the Space Battleship Yamato section. Due to popular demand (and I DO emphasize DEMAND), I have finally produced this portion. For those of you who didn't read the F.A.Q. and decided to email me asking, "When is the next section going to be up? You haven't done an update since last November, you loser!" obviously, such a question (and others like it) not receiving a response from me. Well...now you know! I've added a little extra in the Yamato page, a special comparison between the Space Battleship Yamato (or Argo as some Americans know her to be) and the original World War II Japanese Battleship HIJMS Yamato, which was sunk on April 7, 1945. She was assigned to a final suicide mission against American naval forces in the Pacific during the closing days of the war and was destroyed in the Sea of Japan. So there it is. I'm going to go back and process the small backfill of Star Trek designs that have built up in the recent months. Once complete, I intend to start work on the final, Babylon Five, section. Again PLEASE refrain from sending me emails asking when the next update is going to be. If you only knew the time and effort required to maintain this site, you would understand my time allocation process. It's not a simple as you think, believe me! So, that all being said, enjoy, and I'll see you again next time! Nine new groups of designs are now available in the Star Trek section. Five new groups of designs are now available in the Star Trek section. Three new groups of designs are now available in the Star Trek section. Another LARGE update to the Star Trek section, contributed by one of our most prolific submitters, Mike Brown. LARGE update to the Star Trek section. Small update to the Star Trek section. Looks like I was struck by a Y2K bug of my own (very embarrassing). The hit counter on the main page read "100" instead of "2000" (weird). I downloaded the latest version of the hit counter I was using (2.5), which promptly fixed the problem. If anyone is interested in obtaining source code for this hit counter, it can be found on the author's web page at Muhammad A Muquit's WWW Homepage Access Counter and Clock. Added the new Battlestar Galactica section!! Now you all know what I've been so busy doing that I didn't have time to answer all your emails asking for updates! Also added the new official list of "Other Miscellaneous and Non-Aligned Races/Organizations". Check the Star Trek section's Chronology for details. New additions and updates have been added to multiple sections. Check the Star Trek section's Chronology for details. New additions have been added to the Federation section. Check the Star Trek section's Chronology for details. I'm sure you've noticed the slight change in format with the front page. I've added place holders for the three other genres I intend to add schematics for. As I have an eight-month backlog of designs, I'm still compiling those together. I just wanted to get the site back up for the time being with some new graphics to inform people that some new stuff was coming down the pipe. The Trek-related stuff, as a result, has shifted down by one level. All the things that were there still are, soon to be adding some more. Another thing you may notice is the split-up of the Chronology and F.A.Q. sections. Since I have questions/answers/chronological milestones which are pertinent to only one section, I'm going to place these items of interest in their respective sessions. Any ground-shaking all-applying events worthy of the Chronology or F.A.Q. will be located in said sections, at the highest level of the website. Pretty simple? I'd like to think so. Links, bibliographies, and Webrings will also be specific to sections, separating between Trek, Galactica, B5 and Yamato references, etc. References, Reviews & Awards will be located only at the highest level, applying to the overall database in general.